So excited to be taking professional screen printing lessons at The VERA Project next month! Looking forward to figuring out what wants to go on their booties and then completing my first batch of stock! Was so delighted to celebrate Christmas with the family in Michigan this week. Gave my dad 5 pairs of undies, 2 from his old tshirts, and he was thrilled. At first he didn't quite get it... "Oh, Fall Creek Falls, Tennesse. We had such a great time there! Where'd you find these?" But when he figured out what was going on, he got really happy. And seemed so proud of me and my idea. That meant a lot. Was tickled today to see this article in USA Today about how wearing an ill-fitting pair of underwear can ruin your day. So true! I know we all have those pairs in the bottom of our drawers that don't fit will and that we only wear when absolutely necessary. I'm slowly but surely trying to weed those bad pairs out and replacing them with my own Uptiees! Lovelovelove how Upitees line up against all the complaints women made about their underwear. The top complaint, Wedgies (30%), are definitely few and few between (insert cheek joke here), then "doesn't lay flat under clothes" (19%), I think they're pretty alright on, and "not enough coverage in the rear" (14%) is definitely something that Upitees are not guilty of! Can't wait to see what these turn into! 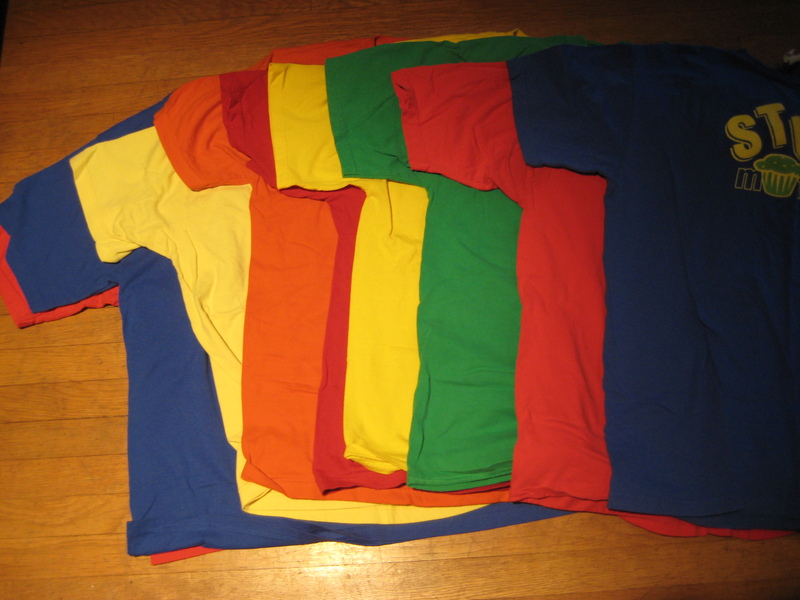 A Crayola box of tshirts!